Didier’s favorite jam flavor is strawberry and rhubarb so when I had a surplus of fragrant strawberries from the Silver Lake Farms CSA last week, I bought some pretty pink sticks of rhubarb and decided to cook up a batch for him. One of the joys of living in Los Angeles is the fresh citrus that you can pick off the trees – the ripe and juicy lemon added an extra zing with its fresh straight-from-the tree zest and juice and also the much needed natural pectin to get that perfect set. I love making jam – apricot jam, blackberry jam, and even that sophisticated and oh so British orange jam (AKA marmalade). As I stirred my jam I was reminded of happy times last February when my friend Emma Cheney drove all across LA searching for apricots for a jam challenge, eventually she gave up and switched to blueberries – the moral of this jam tale is always use seasonal fruit for the best results. There are two types of jam I like to make – the first being the one I cook up and eat immediately and that keeps in the refrigerator for about a month and second being the jam that requires a lot more sugar and needs to be sealed so you can store it and keep the essence of seasonal fruit locked in a jar for rainy days. 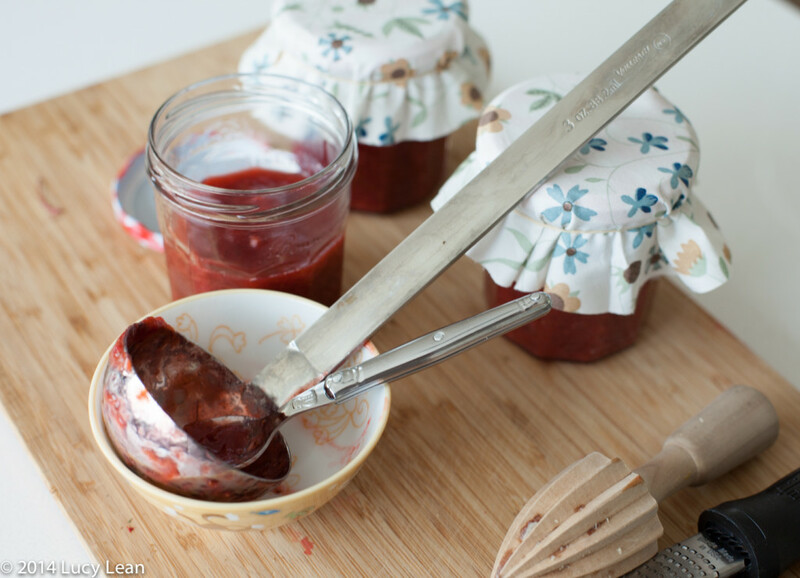 I now spend less time making the later and processing the pots of jam I make and instead make a little less jam, with a lot less sugar (added to help preserve the fruit), and keep it in the refrigerator – it gets eaten long before it goes bad. There was a small amount of the warm jam left over so I put it with custard and Minty and her friend ate it up as a special treat. Makes two pots of jam with a little left over to eat with custard! 1. Hull the strawberries and cut into quarters. 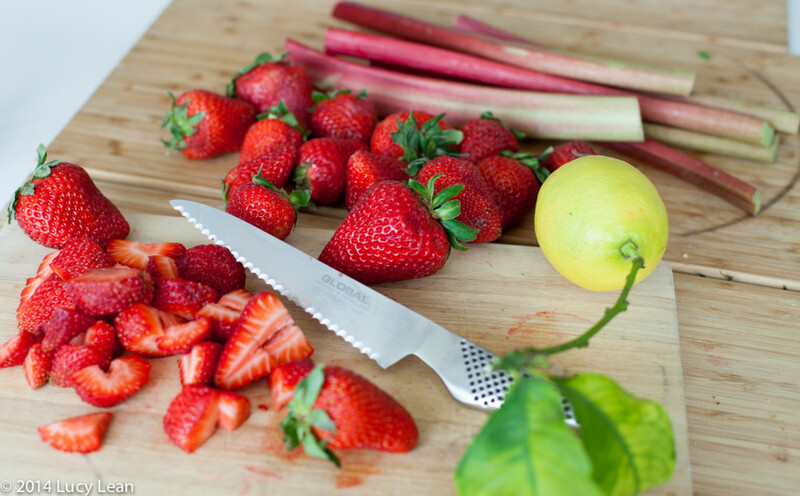 Slice the Rhubarb into half inch pieces. 2. Place a saucer for testing the set in the freezer. 3. 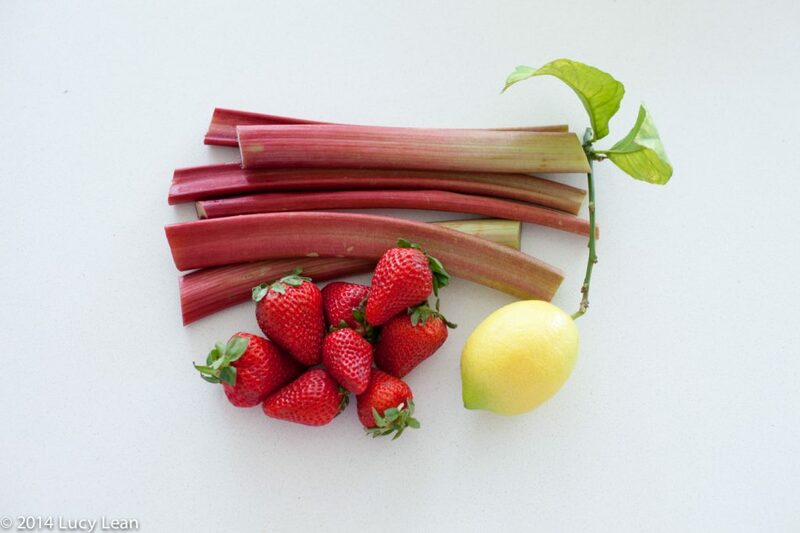 Put the fruit, lemon zest and juice in a large pan over medium heat. Stir frequently as the fruit cooks and releases its juices. 4. 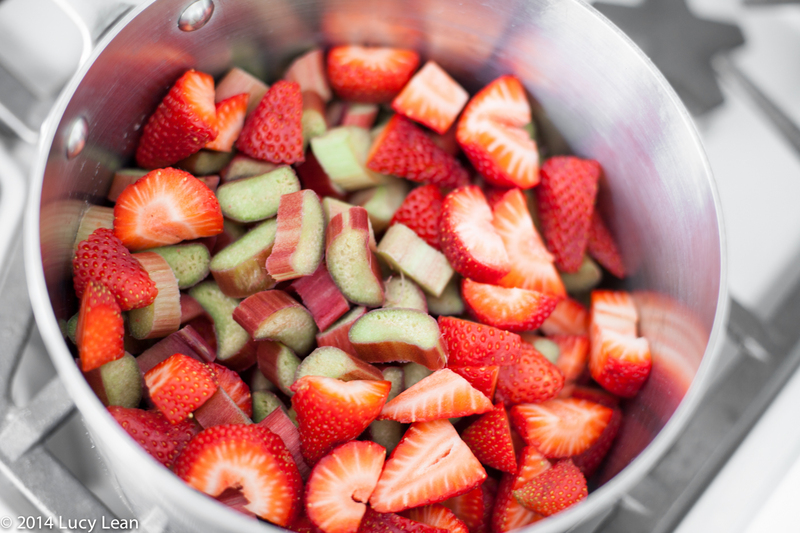 When the rhubarb is soft add the sugar and cook uncovered for about 20 minutes, stirring so that the jam doesn’t burn. Skim off any foam from the surface. 5. When the jam has reduced and is beginning to thicken it’s time to do the first set test. 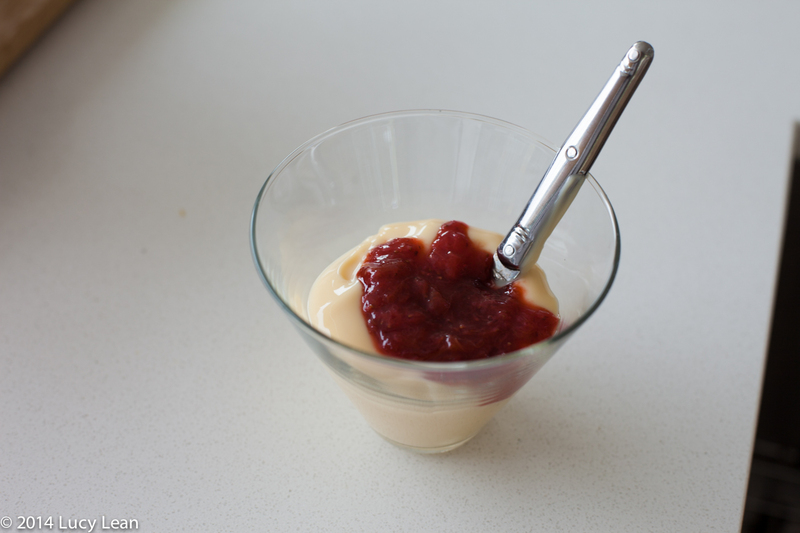 Place a small amount of the jam on the chilled saucer and return to the freezer for 2 minutes. Push the cold jam with your fingertip to see if it wrinkles and is set. If it’s still too runny in consistency continue to cook until the perfect set is reached. 6. 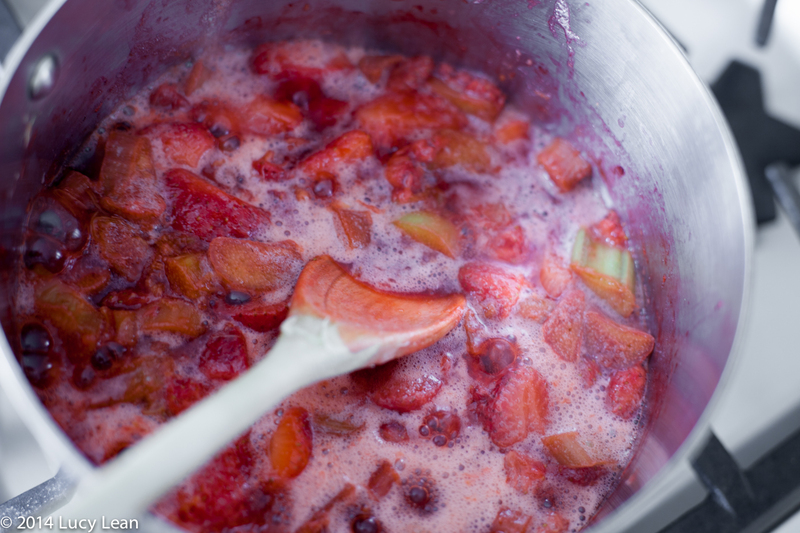 Transfer the hot jam to clean pots with tightly fitting lids. Store in the refrigerator. 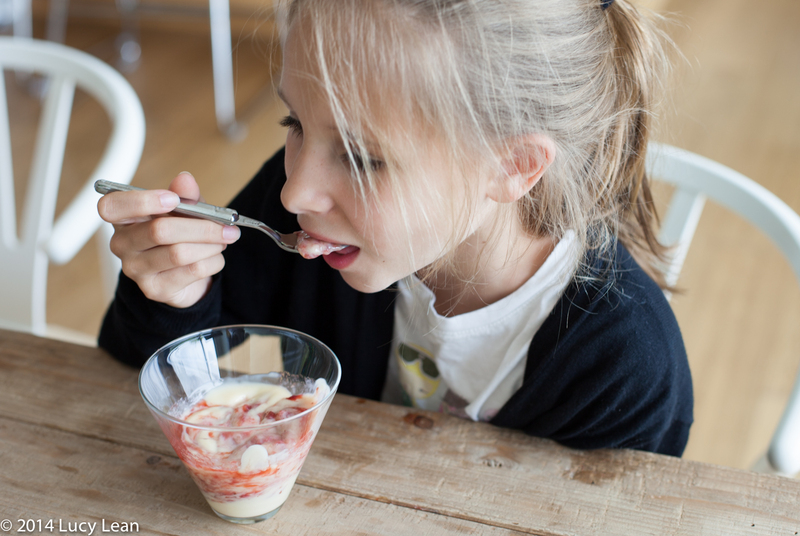 Eat with custard for a special dessert or as a jam for breakfast on hot buttered toast.